Just as there are different grapes for eating and for making wine, so it is with rice and sake. While table rice can be used for sake production, the premium producers will use a specific type.There are more than 100 different kinds of Sake Rice in Japan. As an ingredient,concentration of starch within the White Core is converted into glucose through Saccharification by enzyme produced by Koji mould. Koji mould is a micro organisms which aresprinkled over and grow spores into steamed rice. Its enzyme breaks down starch into sugar in form of glucose. 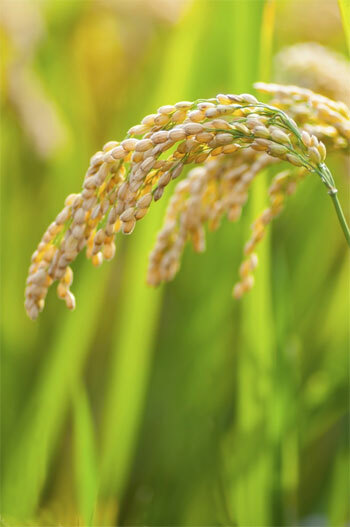 Sake rice is more expensive as it is more difficult to grow because it is prone to heavy rain and strong wind as its ear is taller than table rice.It is also more vulnerable to pests compared to table rice. Due to the small amounts being produced, many sake producers opt for table rice. Examples of famous Sake Rice are Yamadanishiki, Gohyakumangoku, Dewasansan, Miyamanishiki, Hattannishiki and Omachi. Sake is made up with 80% water. The use of water in sake making is a very important subject. Water is used from washing rice to dilution of the final product before bottling. The total amount of water used to brew sake is about 30 times more than the amount of rice used. Many breweries have their water sources nearby, and what kind of water they use as an ingredient largely determines the style of sake.Generally speaking, softer the water, more feminine, silkier and smoother the resulting sake, harder it is more masculine and tight structured sake it becomes. Certain minerals within the water can havean adverse effect on the quality of the sake. For example, iron will react with amino acidsand produce unpleasant flavours and a yellow colour in the finished sake. Some minerals are nutrients for yeasts that will encouragea faster fermentation. Unfortunately, faster fermentation will mean a less fragrant, harder and drier sake. This means that the harder the water, the drier the resulting sake will be; the softer the water, the softer and sweeter the sake. 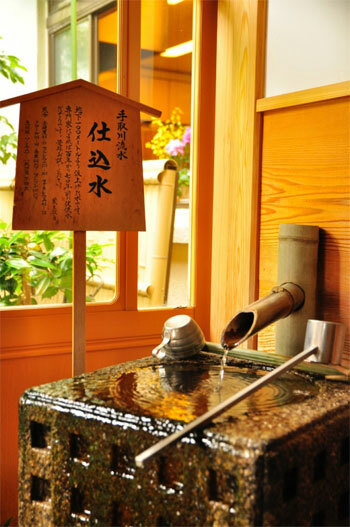 The most famous water source for sake brewing is “Miyamizu”, an underground well from the Nada region in Hyogo. Breweries may source their water from subterranean wells, rivers, lakes, or, sometimes, even from the tap, just like many beer brewers. However, they are allowed to filter the water and adjust the mineral content to some extent by adding beneficial minerals to their water. 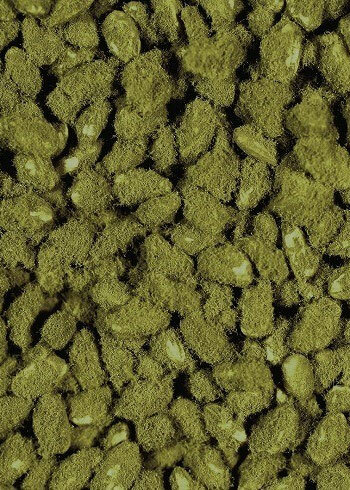 Koji (aspergillusoryzae)is a kind of mould used in fermentation in East Asian Cuisine from soya beans to other starch sacharrifications. Koji was listed as a National Fungus of Japan by Dr.EijiIchishima in 2006 for its importance in Japan’s everyday diet. There are three different kinds of Koji – White, Yellow and Black. However, it is yellow koji that is used mainly for sake production nowadays. Koji is an important component of Sake as it is this that converts the starch in the rice into glucose by producing enzymesonce propagated onto steamed rice. 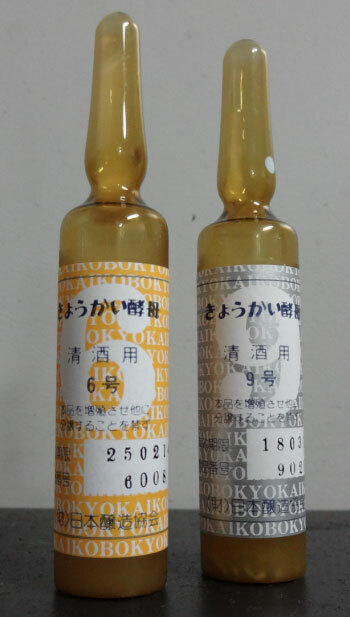 The amount of starch that is converted into sugar will determine the style and quality of sake, and to get right degree of conversion requires very fine skills. Sake is made complex with other kinds of via flavors such as amino acids and peptids, which are produced when the enzymes breaks down protein and fat. Yeast can be bought from the Japan Brewers Association or cultivated within the brewery itself. The reason for yeast cultivation is to achieve consistency within the finished sake. There are forming and non-forming yeasts, where non-forming yeasts are more popular choice due to its efficient brewing process as no need to control growing forms in the fermentation tanks. There are yeasts suitable for ginjo sake brewing and others which are not. Yeasts suitable for ginjo brewing are much more difficult to handle in terms of temperature control. Those prefers lower temperature for its fermentation in comparison to other kinds of yeasts.